Widely used in landscaping as a ground cover plant Scaevola comes in a number of varieties and flower colours. The popular S. humilis is sold under a number of names and will grow to form a dense matt with masses of purple flowers in spring through summer. Some cultivars are lower growing than others and require less maintenance. Along with the drought tolerant nature and ability to grow well in a range of soil types the only issue is with heavy frosts which will set the plant back a little however it does quickly recover. S. aemula – Fairy Fan Flower, lower growing to 50 cm. 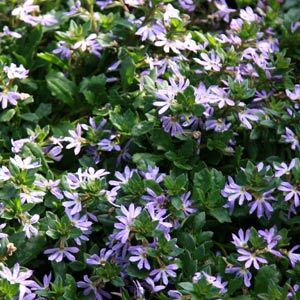 Scaevola or ‘Fan Flower’ make a good drought tolerant ground cover plant. Includes Scaevola humilus, Scaevola aemula and other species. Wholesale Nurseries, Tube Stock. Water in well and for 2 months water regularly. If planted in spring plants may require watering through the first summer. Light pruning once a year will help maintain a compact tidy shape.